“In 2012, the NoMa Public Realm Design Plan envisioned “art parks” at the four points in the neighborhood where roads pass beneath railroad tracks. In 2014, an international design competition for the L and M street NE underpasses resulted in 248 design entries from teams in 14 different countries. The 10 finalist entries were presented to the NoMa community for input on aesthetic concepts and functionality, resulting in more than 370 public comments on the designs. 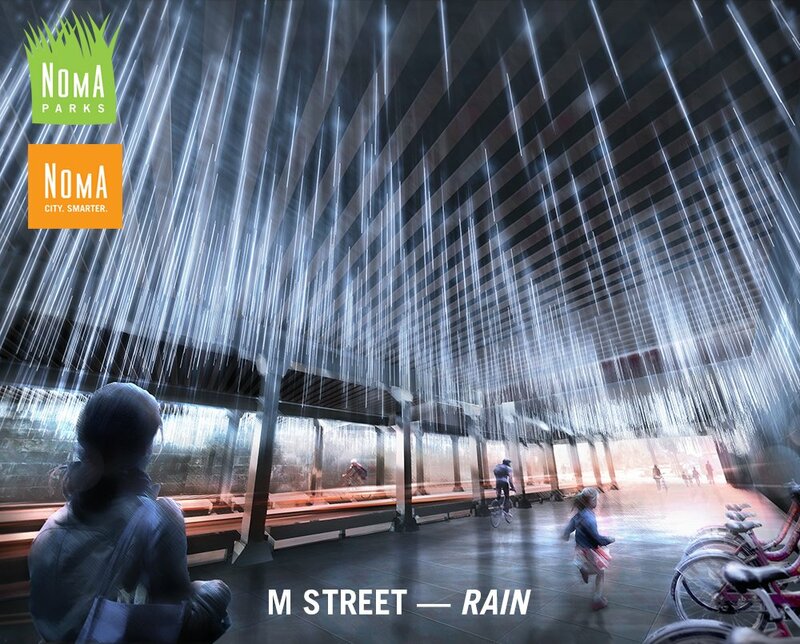 In 2015, the NoMa Parks Foundation named Thurlow Small Architecture + NIO architecten’s installation Rain as the winning design for M Street, and Future Cities Lab’s installation Lightweave as the winning design for L Street. 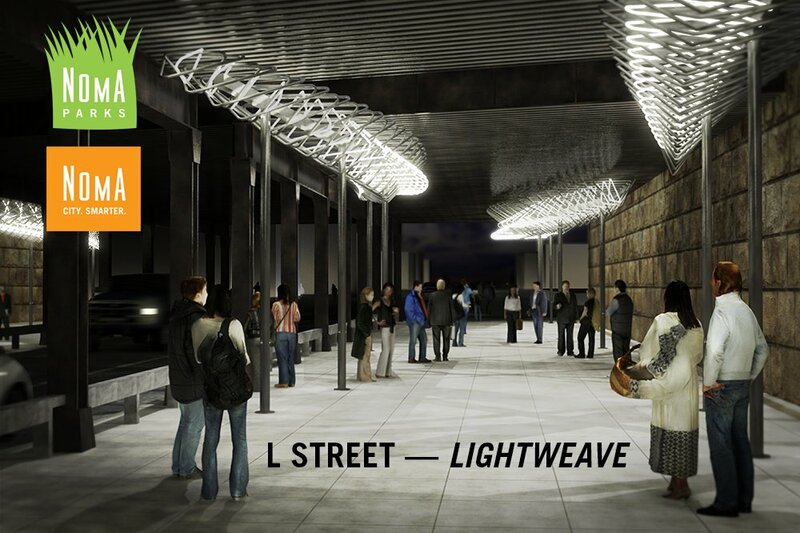 Now, after years of planning, fabrication, and hard work, the NPF and the NoMa BID are pleased to announce that all is set to begin the installation of the L and M street NE underpass art parks. Below are some important details about construction work and disruptions to pedestrian and cyclist movement along these spaces over the next couple of months. The sidewalk on the south side of M Street will be completely blocked off with fencing. The fence will not prohibit access to the bike-repair station next to the Metropolitan Branch Trail ramp. The sidewalk on the north side of M Street will be partially blocked along the wall with fencing. A pedestrian/bicycle passageway will remain open, and access to the Capital Bikeshare station in the underpass will continue. “Sidewalk closed” signs will be installed on both sides of the underpass to alert cyclists. Within two or three weeks, the Capital Bikeshare station will be temporarily relocated to the southwest corner of 3rd and M streets NE, next to Uline Arena. Construction begins on the south side of M Street and is anticipated to take about three weeks. Once work on the south side is complete, the north side of the M Street underpass will be fully fenced, and construction will continue there. The sidewalk on the north side of L Street will be partially blocked along the wall with fencing. A pedestrian/bicycle passageway will remain open. The sidewalk on the south side of L Street will be partially blocked along the wall with fencing. A pedestrian/bicycle passageway will remain open. Anticipated start date for Lightweave construction work. The north side of L Street will be fully fenced off at this time. Once work on the north side is complete, the south side of the L Street underpass will be fully fenced off, and construction will continue there.